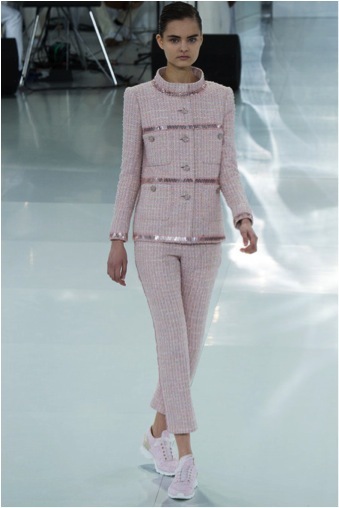 Karl Lagerfeld can do no wrong in my eyes (or the majority of the fashion world for that matter.) However, when he paired sneakers with his entire Chanel Couture Spring/Summer 2014 show, more than a few eyebrows were raised. While ‘chic sneaks,’ as I have been calling them, have been a growing trend in the last 6-9 months, the look can be intimidating to pull off. While I applaud the move towards comfortable, wearable fashion, I still shudder recalling images of bad 90s power suits paired with white Nikes charging down Madison Avenue. While Karl can, of course, put his girls in evening gowns and new balances (pretty sure he could put a girl in a black and white trashbag and i would still swoon) – I reserve this look for brunches/lunches, errands, birthday parties and casual drinks with friends- definitely no sneaker donning black tie galas in my future.) Regardless of where you debut this special look, the juxtaposition of girlie pastels, laces, and floral with sporty sneakers is beyonddddd. Like on. another. planet. tres cool + tres comfortable = a winner in my book. what do yall think about this snazzy sneaker trend?? after ten inches of snow this week (I incorrectly thought the plus of practically moving to south carolina meant I live in a snow-free zone) i have never been more ready for warm weather. i need the sun, sand and a cold drink in my hand a.s.a.p. – but even more than those things, i need warm weather clothes- bikinis, caftans, white jeans, summer sandals, etc. luckily a spring break trip is coming up (if you can call something 4+ weeks out ‘coming up’, and i have been busy doing some serious shopping to prepare. 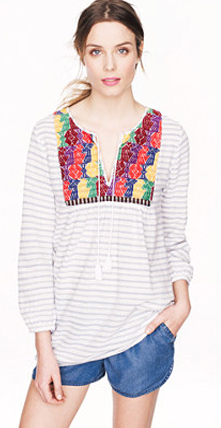 a trip to jcrew today uncovered the perfect new tunic– a great length that is long enough to cover your swimsuit, but not too long so that it looks like a dress. i plan on wearing it over a solid suit, currently dying over this black zinke binkini. 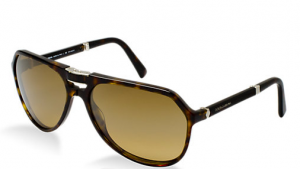 i also took a dangerously expensive trip into sunglass hut and discovered these D&G bad boys– completely fold able and the perfect trendy but classic aviator shape. (my small face has a hard time finding aviators that are the right size- i.e. dont look too small/squished or so huge like im wearing ron burgundy’s sunglasses- very goldilocks of me, i know) i mean- they are EVERYTHING. can you say ‘thanks tax refund’?? now you know what i’m currently craving for summer- who’s with me? what are the items on the top of your ‘to get’ list? 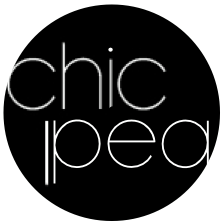 happy weekend chic peas! i found myself perusing instagram this morning for some divine sartorial inspiration and found the look below. i have gushed about my love for sophia webster many times before, but lest any of you forget- check out these puppies. sophia’s shoes are the perfect statement piece- colorful, fun and always a little sassy. they could possibly be a little overwhelming to style since they are so distinct, but I love how the chic pea above paired hers with more neutral basics. and it doesn’t hurt she has the givenchy antigona. drool. while I am all about purchasing investment pieces and wearing them into the ground, there are also tons of great options to recreate this look at a lower price point. the popularity of ‘statement shoes’ and creation of monthly shoe websites like sole society and shoe mint have made options endless. my pick are these, from shoe dazzle. they have the same gold sole, black velvet and similar cut out style. one item my closet has been craving since the fall (but i have yet to pull the trigger on) is a bohemian staple turned fresh again – the bucket bag. 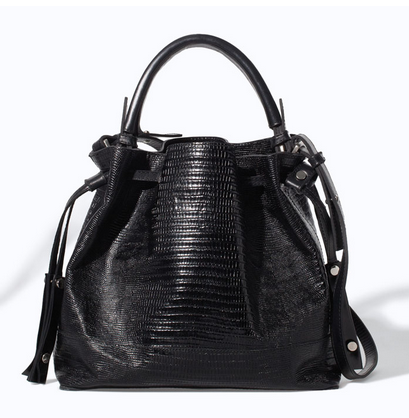 another classic option is the alexander wang Diego. It’s a street style favorite that comes in a ton of different colors (shown in neon yellow in the photo above.) 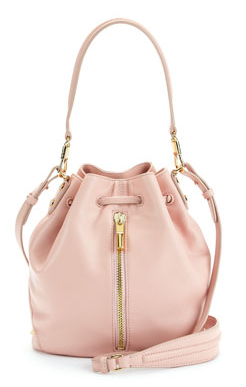 i also love this pastel pink Elizabeth & James for spring- MK & A sure know how to make a hippie satchel fresh again. 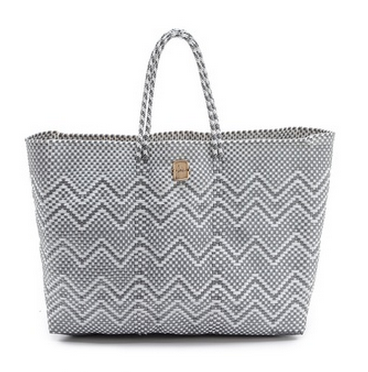 both are the perfect for the coming warmer months- guaranteed to hold everything you need while running errands, and toting plenty of sunscreen to the pool and beach.